The Journal of Ethnic and Migration Studies (JEMS) is hosted at the Sussex Centre for Migration Research (SCMR) and run by Paul Statham (Editor), James Hampshire (Deputy Editor) and Sharon Krummel (Editorial Officer) since 2013. JEMS publishes the results of high-quality, cutting-edge research from across the social science disciplines that addresses themes relating to ethnic relations, diversity and migration. 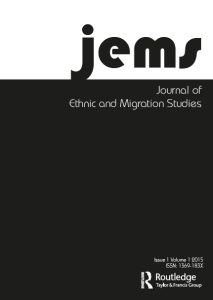 Within the field, JEMS is a ‘broad church’ and open to a range of disciplines and perspectives on all forms of migration and its consequences, as well as ethnic relations, discrimination, racism, nationalism and transnationalism, citizenship, identity and hybridity, globalisation and cosmopolitanism, and policies of integration. Contributions to the Journal are especially welcome when they are the result of comparative research, for example within Europe, between one or more European country and the countries of North America and the Asia-Pacific, or between migrant groups. More about Journal of Ethnic and Migration Studies.